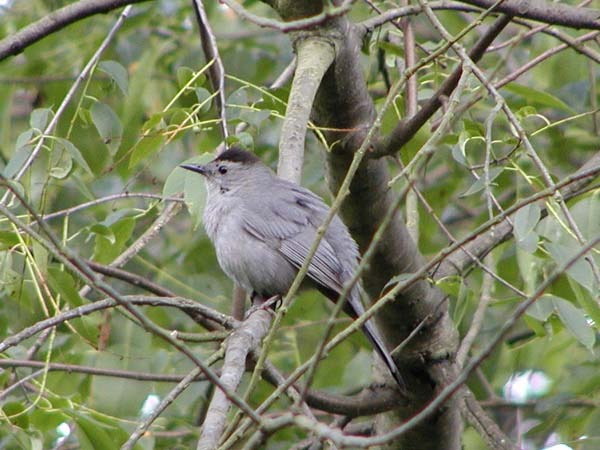 The Catbird is so named due to its cat-like sounds. Besides such sounds it can make beautiful melodic whistles and songs. This is the view most people are familiar with, a dark gray bird with a black cap. However, this bird also has a red area under its tail. It took me a while to take a suitable picture, but look at the second picture! 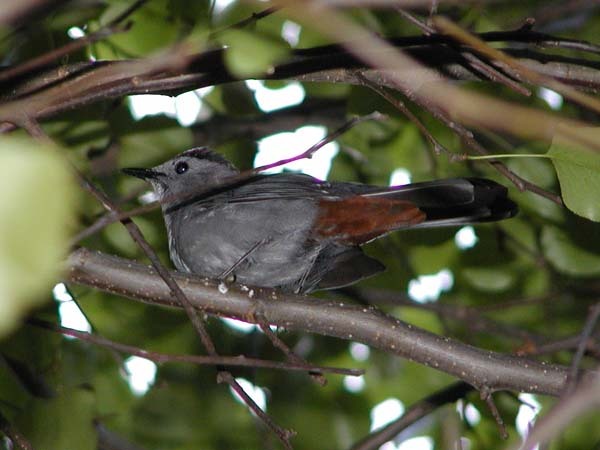 As you can see, the Catbird has a red coloring under its tail... These birds are very friendly and usually are not scared of people. This particular one made a nest in the top of a forsythia bush I planted behind our house. The bush is next to the house near the old deck as you can see in the picture on the left. The pair would fly to the bush often with twigs and grass. Well, one day I checked, and there were three lovely blue eggs. The Catbird eggs are a darker blue than the eggs of the Bluebird. Also, since the bird is larger, the eggs are larger than those of the Bluebird. Not long after I saw the eggs, I saw these two babies. Apparently, the third egg did not hatch. These babies are only a day or two old, eyes still closed. Below are a set of pictures as the babies grew progressively older. It is amazing how much growth baby birds go through in just a few days! Note one of them is still underneath, hiding its head in some of the pictures. These pictures are at 3, 4, 5, and 8 days of age!